State Medicaid programs and other state health agencies need to monitor and evaluate changes in health insurance coverage, access to care, financing, and the quality of health care delivery. The availability of new financial resources through the Patient Protection and Affordable Care Act is accompanied by raised expectations for such accountability. While state agencies often contract with universities on an ad hoc basis for specific policy projects, fourteen states have established formal state-university partnerships so that their analytic and technical needs can be addressed more readily. 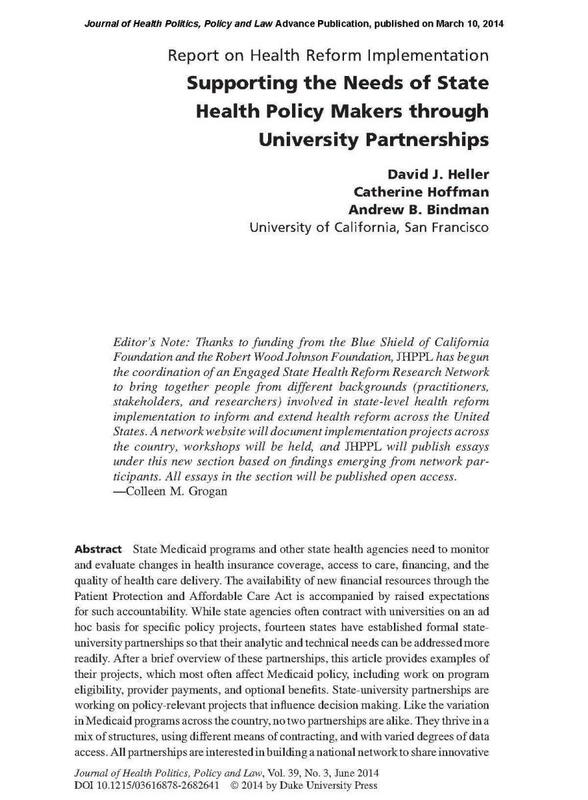 After a brief overview of these partnerships, this article provides examples of their projects, which most often affect Medicaid policy, including work on program eligibility, provider payments, and optional benefits. State-university partnerships are working on policy-relevant projects that influence decision making. Like the variation in Medicaid programs across the country, no two partnerships are alike. They thrive in a mix of structures, using different means of contracting, and with varied degrees of data access. All partnerships are interested in building a national network to share innovative practices and projects, spawn comparative policy studies across states, and support the development of new state-university partnerships.